PocketScrewdrivers.com is your best source for logo promotional screwdrivers. 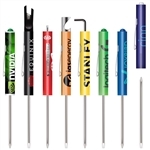 We offer custom printed pocket screwdrivers and Keychain Screwdrivers with many options. 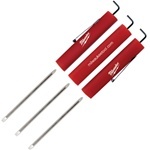 We also offer select individual pocket screwdrivers by the piece with no minimum. When you think promotional screwdrivers, remember pocketscrewdrivers.com for all your needs. 17 in 1 Special Purchase Screwdriver Our 2 in 1 mini screwdriver has a high impact plastic handle, reversible carbon steel & nickel plated blade and pocket clip. Super Tri-Ad Reversible Blade Pocket Screwdriver with pocket clip. Pocket Partner Reversible Blade Pocket Screwdriver with pocket clip. Three Bit Screwdriver with Hex Driver.